Software have always taken a special place in the work environment of a search engine optimizer or an internet marketer. 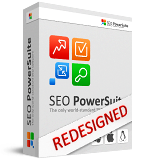 Seo Powersuite is one such software which provides effective reports and provides solutions to increase website rankings on search engines. Rank Tracker – no more manual searches, rank checker helps to check ranks of hundreds of keywords in a few minutes. This package comes with a whole lot of features for checking ranks and creating reports in an easy way. Website Auditor – See where your website can be improved. This software provide special reports after auditing your website and tell you the exact steps for optimizing each web page. Seo Spyglass- Specially designed software for spying your competitors. Link Assistant- No more manual link building efforts. This software would help you to find relevant link partners and relevant link sources for your website. You need to order them separately in order to get the full benefit of the combined power of these 4 pillars of Seo powersuite.